It turns out that I occasionally either have some good ideas or steal ideas off of someone else. Sometimes those things are connected to a geography or computing in a clear way - in which case they will be in the right sort of place. At other times the idea or thing is pretty general. In which case it might end up here (or linked from here). The Only Connect stuff is on the Only Connect page as there's quite a lot of it so it gets its own page. This is an idea from some TEEP training. Allegedly it goes down rather well with persons in suits as it allows even the dimmest suit to realise that people have been making progress - if you're worried at all about what suits think. The original version of this used actual post-it notes place on a basic grid (I think it might have had an extra box somewhere on it). That makes it easily reusable - well, assuming you have an infinite supply of post-it notes (hint: try History departmental stores. They usually have all sorts of useful stuff in them...). You can then use the grids in all sorts of different ways. Using post-its has the advantage that you can get the kids to stick their questions up on a wall and then use them as the basis for following lessons - which is probably quite a good idea generally. 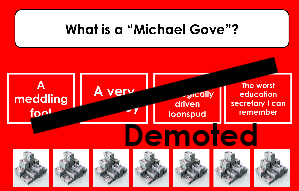 Million Pound Drop - a minor hack of a PowerPoint made by Paul Sturtivant over at the SLN forum which will allow a short million pound drop set of questions to be run. Perhaps as one of those plenary things. The Powerpoint seems to work in all versions as far as I can tell. The money isn't draggable - although I'm working on that. The sound will play in versions of PowerPoint from 2007 onwards it seems (and it'll play automatically and it should be embedded), including for Macs. This page created: 8 July 2014. Last updated: 18 June 2018.